Your body is the place where heaven and earth meet. The greatest spiritual achievement is not transcending the body but joining body and spirit together. But to do this, you must break through assumptions that draw boundaries around the Infinite and wake up to the body as the site of holiness itself. 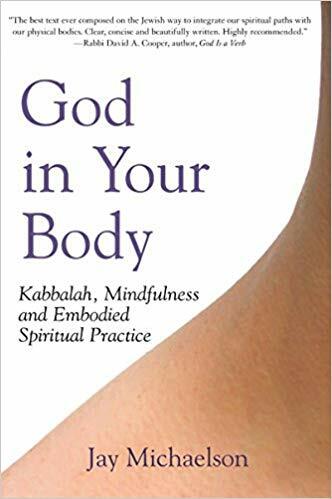 This groundbreaking book is the first comprehensive treatment of the body in Jewish spiritual practice and an essential guide to the sacred. With meditation practices, physical exercises, visualizations and sacred text, you will learn how to experience the presence of the Divine in, and through, your body. And by cultivating an embodied spiritual practice, you will transform everyday activities―eating, walking, breathing, washing―into moments of deep spiritual realization, uniting sacred and sensual, mystical and mundane. This is a wonderful book. Inspiring! I have read most everything Jay Michaelson has written. He's exposed me to a whole universe of Jewish mysticism and spiritual wisdom that, having grown up Catholic, I'd never have been told about. It's been mind- and spirit-expanding. This book, in particular, teaches a positive and wonderfully vivid experience of embodiment within a religious context that Catholicism simply wouldn't have taught. Michaelson gives a very good introduction to Kabbalah, the mystical/esoteric tradition within Judaism. There were so many pearls of wisdom in this easy-to-read, even if about unfamiliar things, and well-written book. Let me cite just two of them. At the end of a chapter on "Exercising," that is, experiencing your workout at the gym as spiritual practice, Michaelson writes: "Remember, secret wisdom isn't secret because it's a complicated formula that can't be spoken. It's secret because it's experiential, and thus cannot be conveyed at all. In all the foregoing practices, the point is always the same: living in the body; grounding perception in its present, vibrant experience; and letting the constructions of the egoic mind slowly relax." And, at the end of a section on Death: "Only by embracing the body can the Ein Sof, the Infinite, truly be extended to all of life, in manifestation as well as essence, community as well as contemplation. We are the Infinite having a human experience, in all its depths and colors and forms. Let's not deprive God of the ride." I recommend this book. It's a nice guidebook for that ride. Reviewed by Toby Johnson, author of Gay Spirituality: Gay Identity and the Transformation of Human Consciousness and other books and novels.